As someone who used to watch Masterchef on TV, I have to wonder why it was so appealing – they just cook food, big whoop. But there’s something about watching someone make a beautiful dish that somehow hits the spot (and of course the editing adds suspense and humour). We don’t even get to taste the food, but the visuals alone seem to hook us. We reckon we know who is deserving of the crown and who isn’t, despite having never tried a single dish. 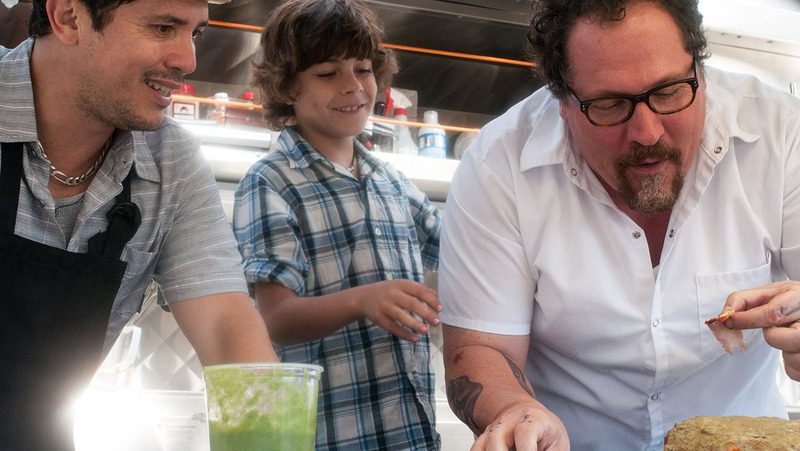 Jon Favreau’s new film, Chef is similarly enjoyable, even though it really isn’t about much. But when he cooks that food, oh yes. I’m so glad I ate dinner just before seeing this otherwise I may have started to drool. He managed to make a toasted cheese sandwich look good. Well, let’s face it, they ARE good. But it was probably the most amazing cheese sandwich I’ve ever seen. It looked so wrong, and yet so right. Butter, cheese, carbs… yes, just YES. 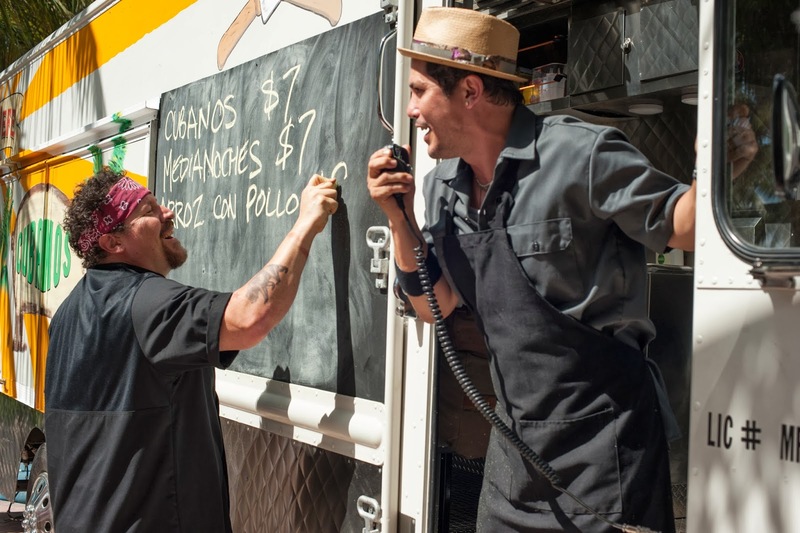 Jon Favreau, director of the first two Iron Man films, directs, writes, produces, and stars as Carl Casper in Chef. It’s quite a departure from Iron Man, and I can only assume this was a passion project. I suppose there is a bit more to it than just cooking – there’s his relationship with his son (Emjay Anthony), as well as his ex-wife (Sofia Vergara) – but ultimately Chef seems like a love song to the art of cooking and having fun while you’re doing it. There are no Gordon Ramsay types hurling abuse, although naturally there is a pompous food critic (Oliver Platt) involved. Chef coasts along at a leisurely pace and I kept waiting for something terrible to happen, but they just continue having fun for the most part. You could criticise it for this, but does every film need high drama? Chef was a welcome break, and to its credit it was never dull. In the early scenes, Favreau is accompanied by John Leguizamo (a.k.a. “I only speak ze truth” Toulouse Lautrec) and Bobby Cannavale, and the three of them provide plenty of laughs as they banter in the kitchen. I was a little bummed when Cannavale’s character took a back-seat – he’s always fun to watch and I love his New Jersey accent. Favreau and Leguizamo continue to amuse throughout, and Emjay Anthony is really sweet as their new comrade (and Carl’s son), Percy. Sofia Vergara as Carl’s ex-wife, Inez, blinded me with her ridiculous beauty (never has the word ‘bombshell’ been more apt). It was a pleasant surprise to see her play Inez down a notch from her role as Gloria in Modern Family. While I love her in that show, I appreciated seeing her more restrained and natural, while still maintaining her comic finesse. There are some big names in the smaller roles here – Robert Downey Jr, Scarlett Johansson and Dustin Hoffman round out the cast. They all do a fantastic job (I never thought Dustin Hoffman could make me hate him), but don’t go in expecting to see much of them. Initially, this film seemed to be getting buzz as a Robert Downey Jr film above all else, when in actual fact he only appears in the one scene (though it is a great one). There’s a big social media element to the script, with Percy setting up a Twitter account for Carl which sets off the chain of events of the film. Social media is prominent throughout, with Percy updating Instagram, Facebook, Twitter, and whatever else 10 year olds are using these days. Some might find this saturation frustrating but dudes, get with it. Twitter is changing the world. Carl Casper wouldn’t have got anywhere near the heights of success as quickly as he did without it (or have been so widely humiliated initially). This is a fast world, and we should embrace it! (Personally, I dream of the day when a celebrity retweets me and I become an overnight sensation). The oldies will say we young people don’t appreciate hard work – we do, but why not embrace the technology that has the potential of propelling us forwards? TWITTER IS NOW. The lack of conflict in Chef may prove a deal breaker for some. It is never really that exciting, but it is a refreshing to see characters that for the most part are just having fun and giving the audience something to smile about. And potentially drool over. Don’t go on an empty stomach. I am drooling just thinking about watching it. Not related to the trailer, which pretty bad, I just drool a lot. However your review may have convinced me to wipe my face and give it a go.